Devon House is one of Perth’s finest examples of Art Deco architecture, and was built for draper John Saunders. Its roofline has a typical Art Deco motif and it has long been admired as a fine building of its type. Erected in 1937 on Hay Street at the same time as the neighbouring Gledden Building, Devon House was only seven metres wide and was praised as a great example of what can be done with a small frontage. The façade was designed to deal with the position of the lift shaft and main staircase, and allow the maximum amount of natural light into the building. Architects Baxter-Cox and Leighton solved these issues by using glass bricks from floors to ceilings, with clear-glass steel-framed panels. The name of the building was written in projecting chromium letters on enamelled steel bars. Shirley’s Frock Shop was one of the early tenants, taking the ground floor and basement, later joined on other floors by dressmaker Lilian Coughlan, photographer Eric Sampey and Esler McMorrow’s School of Dancing. During World War II, Devon House was one of the places chosen to be a shelter in case of an air raid on Perth. The other shelters on Hay Street were the Gledden Building and Levensons. Today, the lower floor of Devon House continues to be used for retail purposes and, despite being overshadowed by the Gledden Building next door, is one of Perth’s purest Art Deco façades. Devon House is a fine example of an Art Deco miniature skyscraper. Its roofline has a typical Art Deco motif and it has long been admired as a fine building of its type. When it was completed in 1937, Devon House was praised as an example of what can be done on a small frontage with a little imagination. Erected on Hay Street next door to, and at the same time as, the impressive Gledden Building, Devon House was only 20ft (7m) wide. The treatment of the façade was even more striking when it is realised that it had to deal with the position of the lift shaft and main staircase, and allow the maximum amount of natural light. Architects Baxter-Cox and Leighton solved this by using glass bricks from floors to ceilings, with clear-glass steel-framed panels. The name of the building was written in projecting chromium letters on enamelled steel bars, and the shop fronts are in black vitrolite. Originally from Devon in England, before becoming a draper in Kalgoorlie, John Saunders established a branch of his business in Wellington Street in 1910. By the end of the 1920s, Saunders was looking to the future and sought out another central retail site, resulting in the purchase of land in Hay Street. Shirleys Frock Shop was one of the early tenants, taking the ground floor and basement, later joined on other floors by dressmaker Lilian Coughlan, photographer Eric Sampey and Esler McMorrow’s School of Dancing. In 1938, John Juan, who used to broadcast on 6WF on Thursday evenings, opened a studio on the third floor of Devon House to teach microphone technique and ballroom dancing. 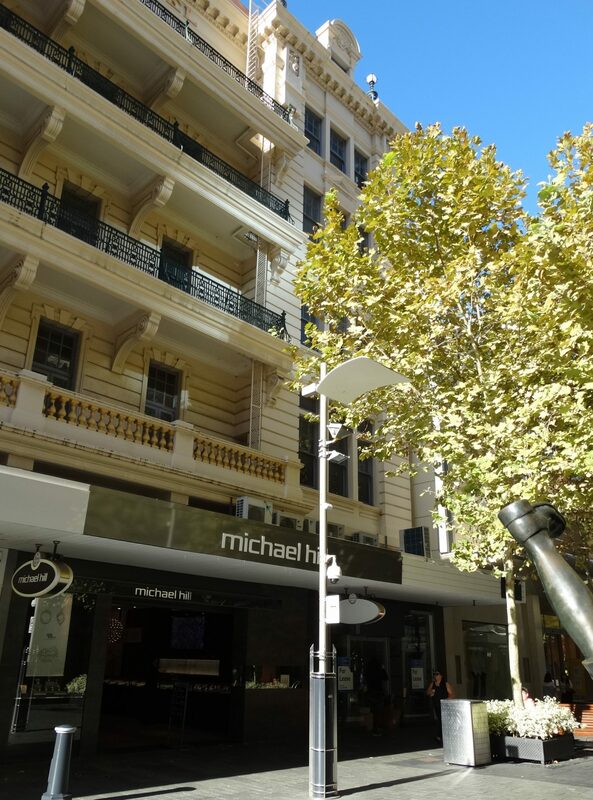 Other building activity in Perth at the time included London Court, Plaza Arcade, the Piccadilly Arcade and Theatre and the Mercantile Mutual Building. All of these, according to the Building and Construction Journal, were examples of “the architectural progress which is changing Perth’s skyline and transforming the city into one of the most beautiful and modern in the Commonwealth”. During World War II, Devon House was one of the places chosen to be a shelter in case of an air raid on Perth. The other shelters on Hay Street were the Gledden Building and Levensons. J. R. Saunders Ltd continued to lease Devon House to a variety of tenants until the early 1950s, when it opened its own outlet there. In 1954, the company had several stores around Perth, including the main store at 499 Wellington Street, and branches in Devon House, Midland, Victoria Park and Claremont. In the early 1980s the company was sold to Roger David Menswear, the firm’s major competitor.